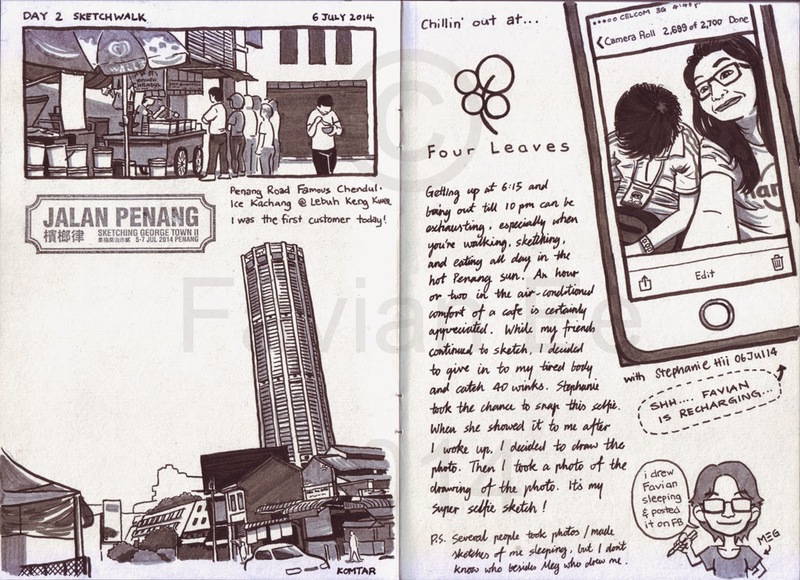 It's been more than a month since I returned from Penang and Sketching George Town 2. 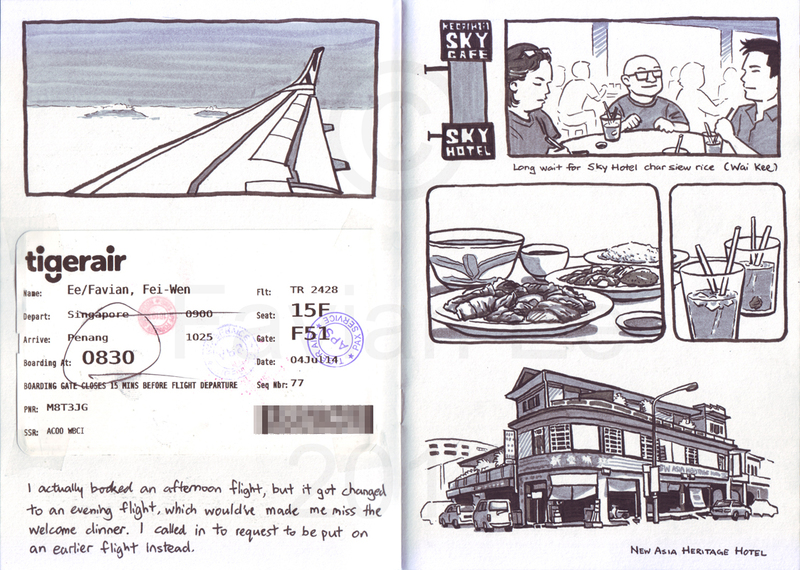 I've finally finished my sketchpacker diary, scanned the pages, cleaned them up, put them together, and put it up for print at Lulu.com. 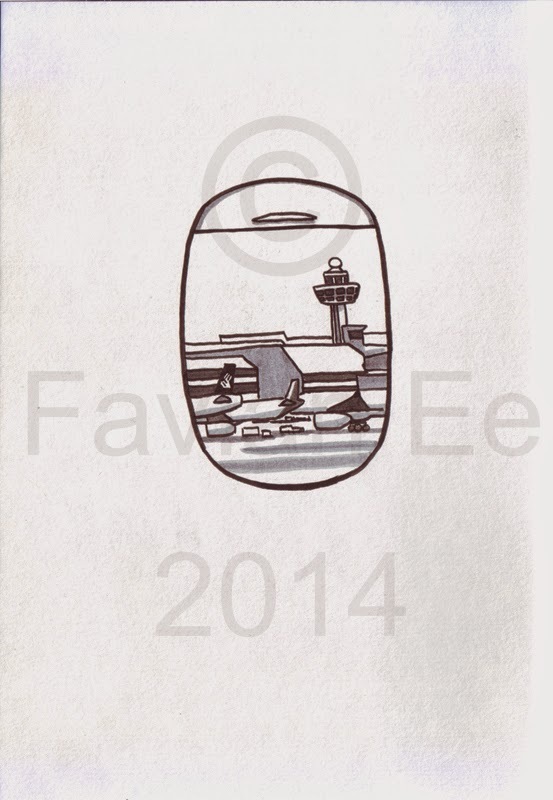 I'm also uploading a copy of the drawings in the sketchbook here with a watermark. They are pretty raw, but there is some colour in the tags/tickets/etc. 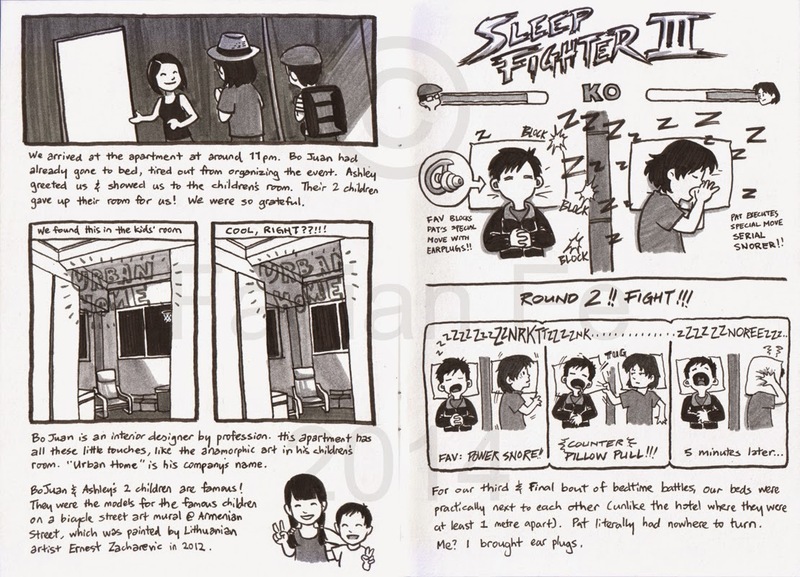 pasted in the book. 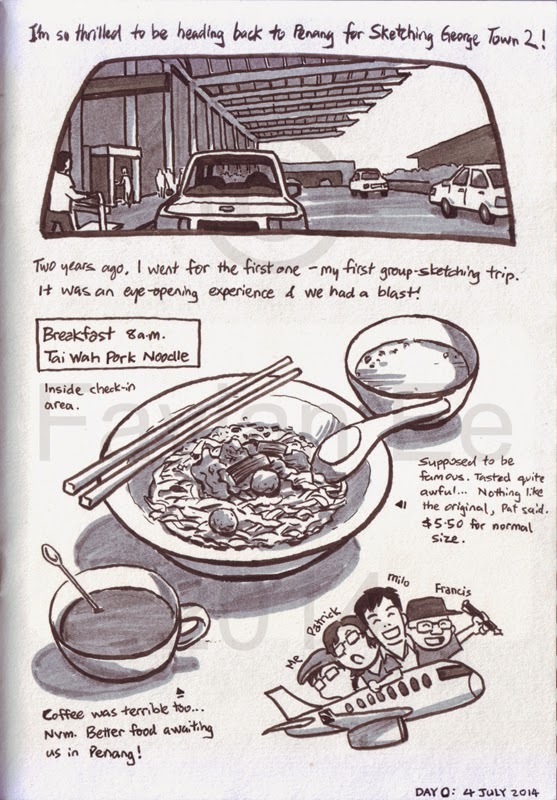 The actual book is fully in greyscale, since the drawings are in greyscale. 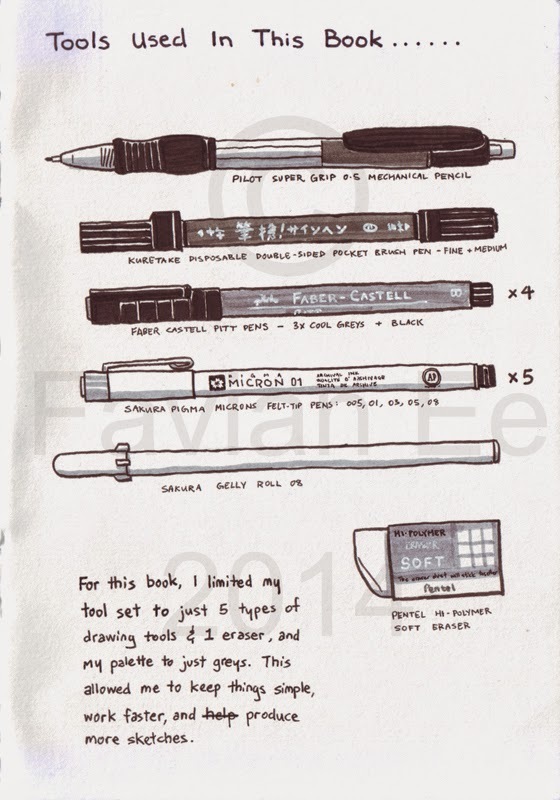 Besides, it doesn't make sense to incur higher costs if only a few pages have a little bit of colour. You may order the book here. It's print-on-demand, so they only print when you order. I would suggest consolidating orders with your friends so you can save on shipping and enjoy bulk discounts. 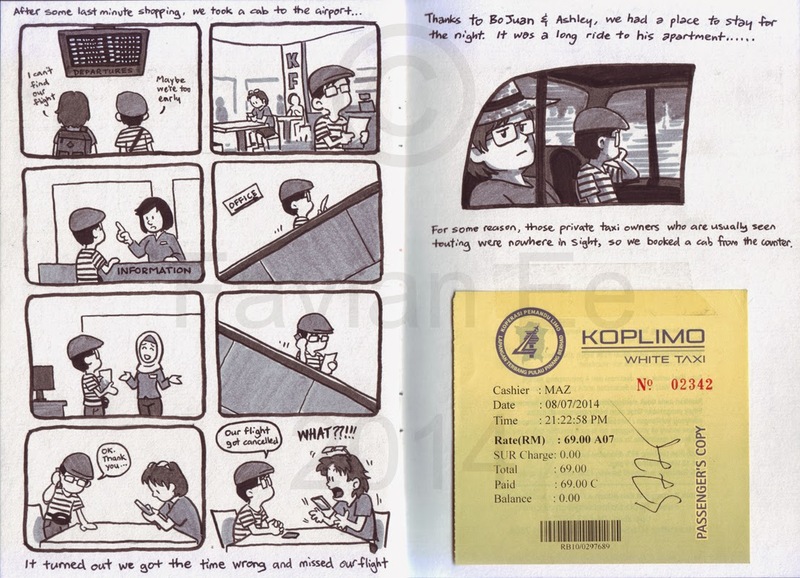 The price of the book is $5.62 USD (excluding shipping, which is $8.99 USD to Singapore). Why such an odd number? Because 562 = SG2. It's just a little memento. I'm pricing it (very) low so people who want a copy can afford one, and because even a few dollars more can be a lot of difference depending on what country you are from. I'm not putting this up for profit, otherwise I would've priced it higher. 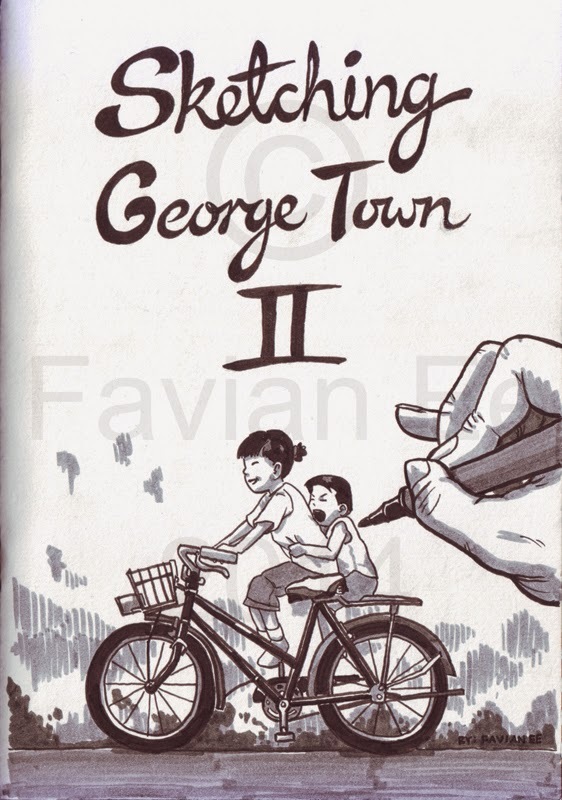 It's mainly for those who attended Sketching George Town 2 and would like to own a hard copy as a memento or souvenir. 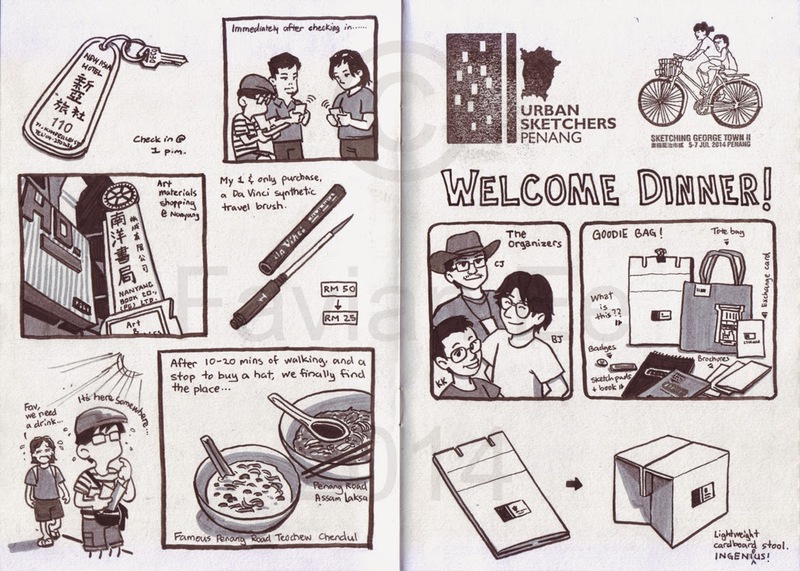 As such, I am not expecting a huge circulation, since only about 200 sketchers attended the event. 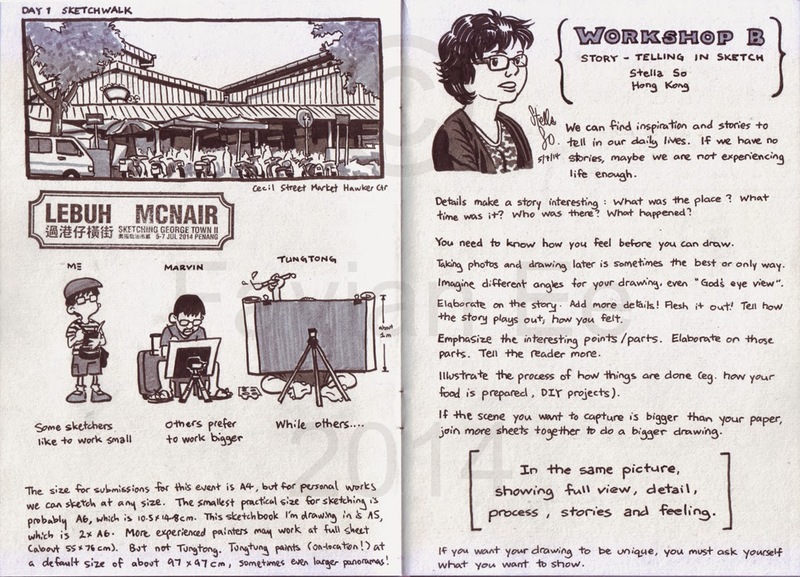 One may ask what's the benefit of ordering the book if the sketches are here on the blog. Well, it's entirely up to you. It's mainly so you can have a hard copy. 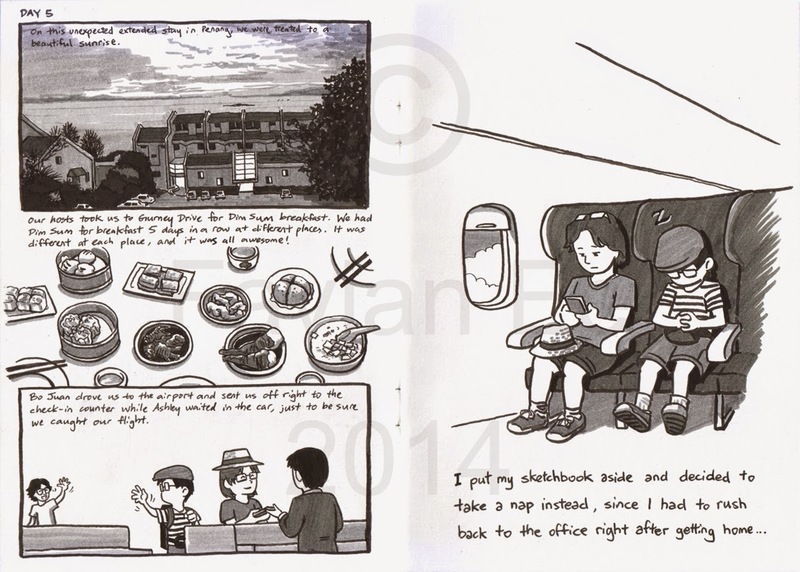 I've cleaned up the scans for the book somewhat (not entirely, since I wanted it to still have a little bit of sketchbook feel) and excluded the watermarks on each page. 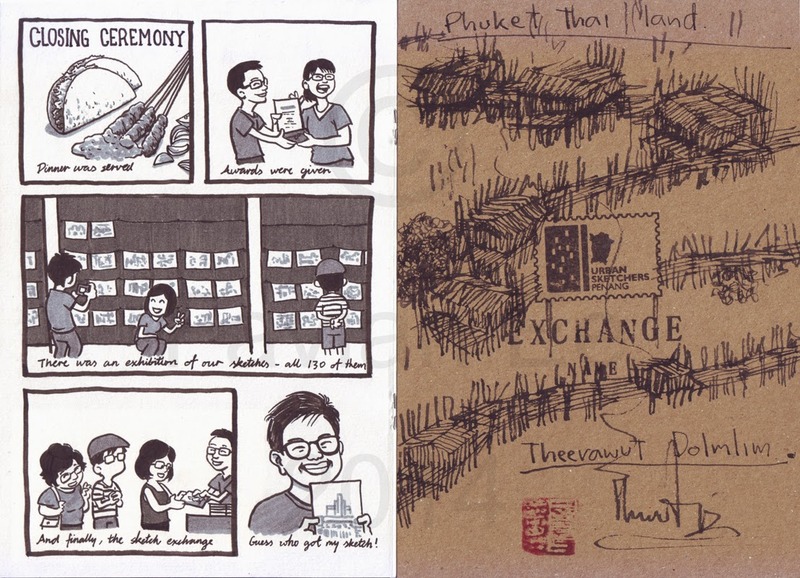 There are also a few extra bits including photos of 3 other pieces I did during the event, which I didn't put up here. 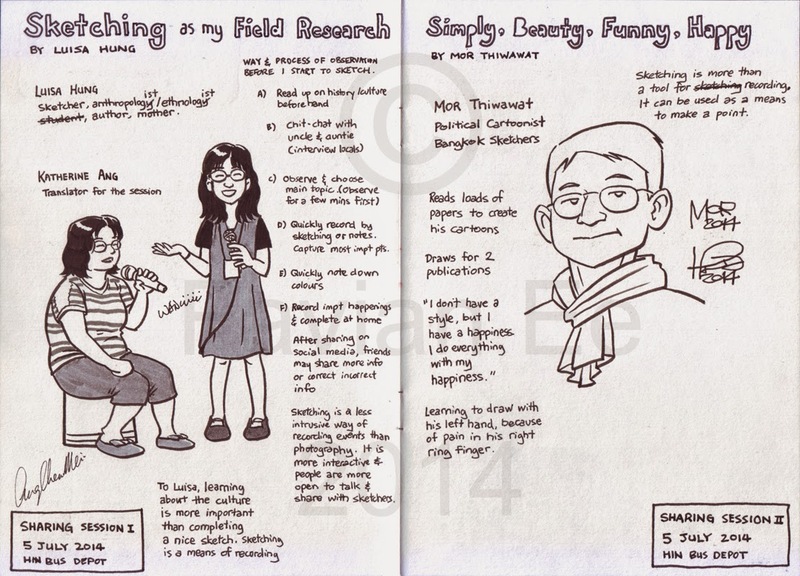 There are also a couple other photos and a short write-up, and acknowledgements to those whose photos I sketched. 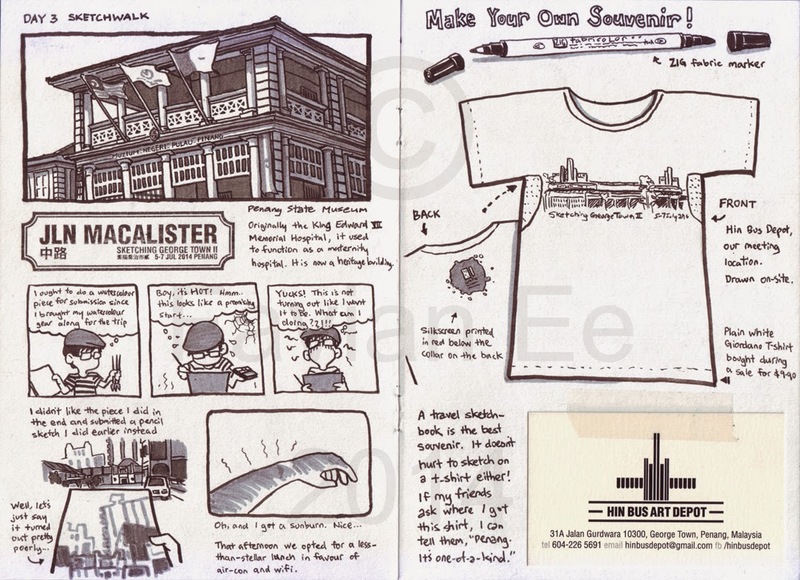 Those are just some of the extra bits in the book for those who are spending the $5.62 to get it. 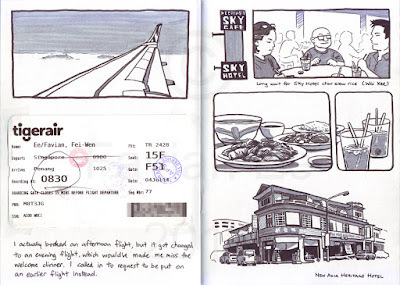 Otherwise, all of the sketches done in this sketchbook have been scanned and posted here. 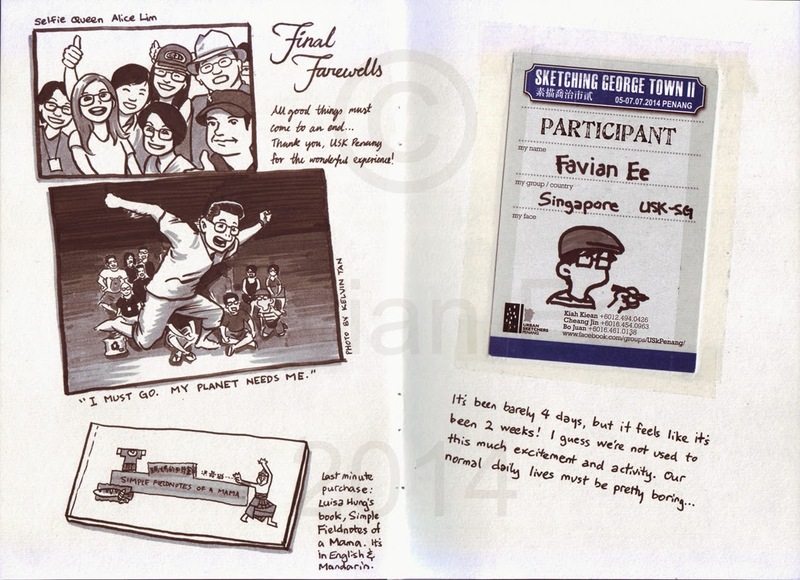 So without further ado, I present to you Sketching George Town II: A Sketchpacker's Diary. 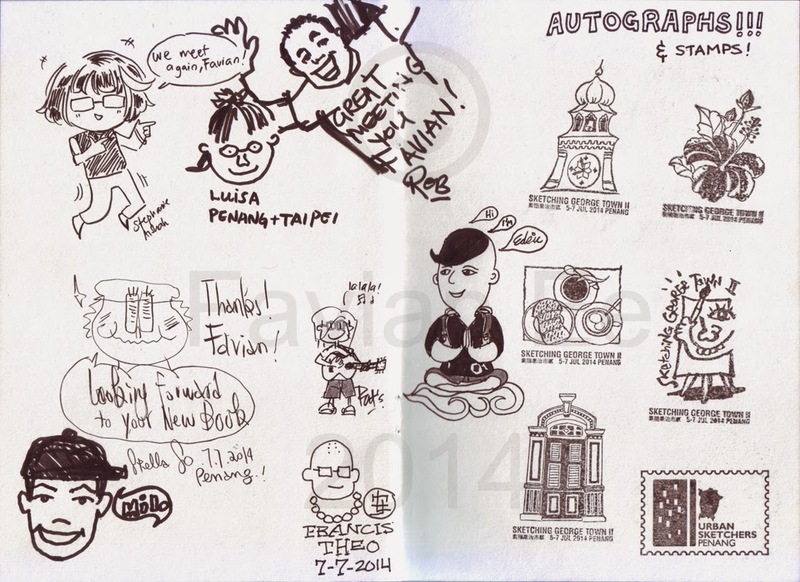 All pictures here are Copyright © Favian Ee, 2014. Disclaimer: I haven't ordered a proof copy for myself, so I don't know what the actual physical copy looks like. If you are ordering, please be aware of this. Melanie Lee sent me a copy of your book and I think it's pretty awesome! Hello Anna! Thanks for your encouragement!